The jurisdiction of the United States Senate Committee on Banking, Housing & Urban Affairs covers, among other things, "all proposed legislation, messages, petitions, memorials and other matters relating to . . . banks, banking, and financial institutions." 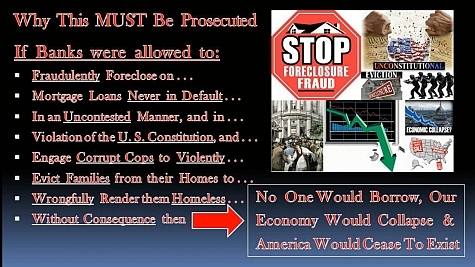 Naturally, this body of esteemed elected officials would wish to have "The Worst Bank Foreclosure Fraud in US History" investigated and resolved, and its perpetrators prosecuted, especially when considering the compelling reasons . . .